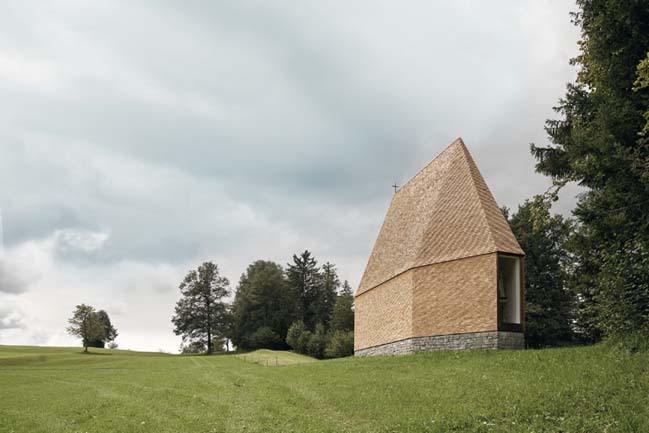 The architecture studio Bernardo Bader Architekten rebuilt an old chapel in Krumbach that use the existing knowledge and the courage to create the new. 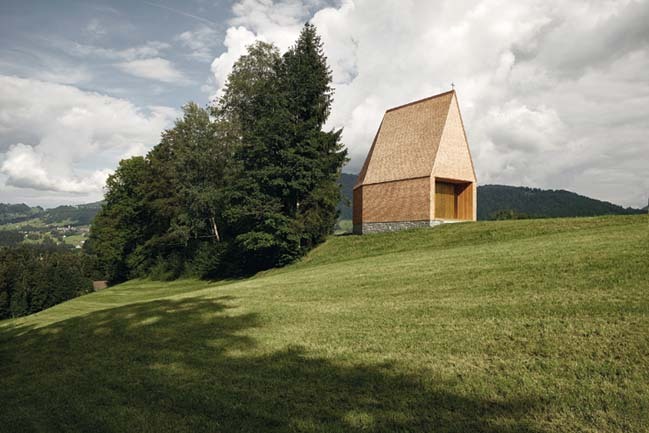 From the architects: Topographically attractively situated at the Nagelfluhrücken, next to the Krumbacher moor, the existing Lourdes –Chapel was rebuilt. A renovation of the old chapel was no longer possible and to regenerate the existing was not the desired aim of the community of Krumbach. Rather, to use the existing knowledge and the courage to create the new. Several years of designing and constructing made an exemplary project visible. More than a hundred of volunteers made it possible to realize the project. 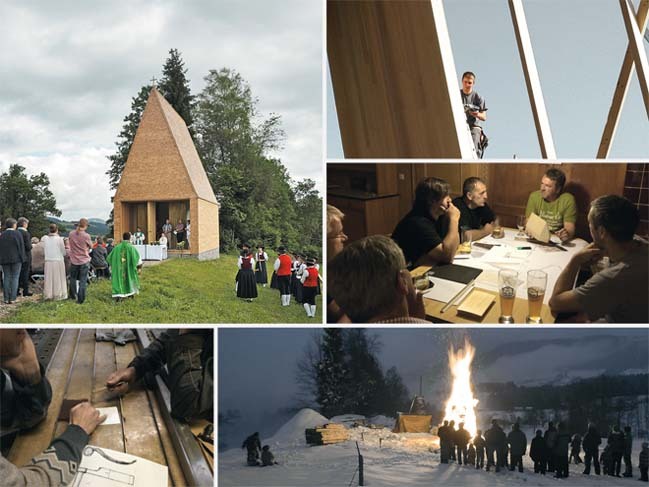 The chapel Salgenreute unites the historical and traditional aspect that characterizes many places in the Bregenzerwald. The chapel is built out of wood and stone. The sun is going to change the wooden façade – it will turn darker, black in the south, silver-grey in the north, just like the old farmhouses from the area. The basic shape is based on the existing 200 year old chapel and includes a main ship as well as an apse. 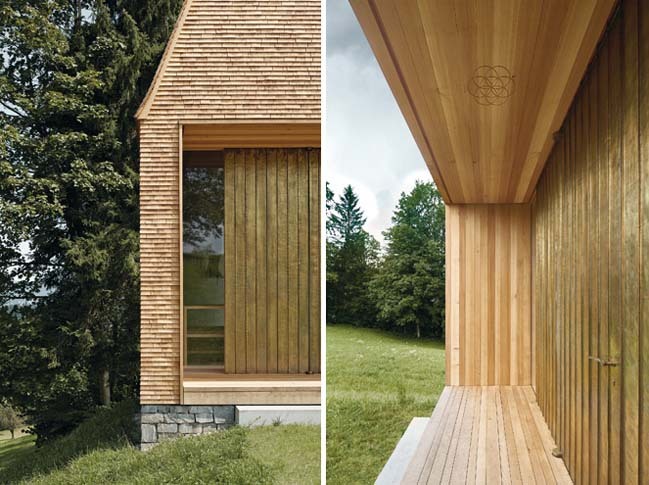 The shape of the room is new – an outstanding steep rising spatial folding made out of wood. 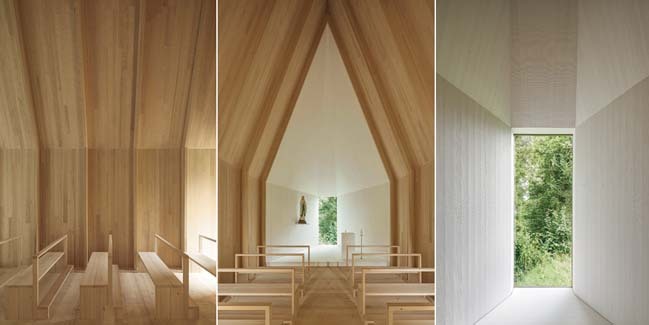 The inside of the chapel is dominated by the homogeneous material of the wall and the roof. The light that shines through the frontal window is providing a special atmosphere. The statue of mother of God, originated from the existing building, is arranged in an other way than in the classical concepts at the side of the apse. The view straight ahead through the white apse leads directly into the nature. 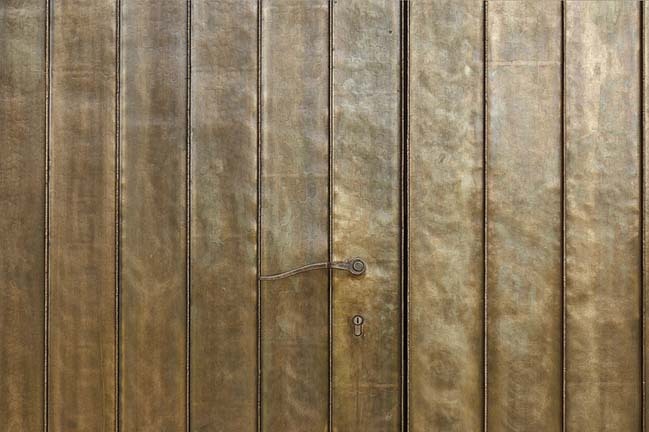 Whoever enters the chapel leaves the solid ground and proceeds a reflective journey.